These days, original features are rare to find in a Porsche. The restoration process becomes very important in vehicles with vintage parts like engines or steering wheels, for example. This needs to be balanced out with the fact that if you are looking at vintage Porsche, restoration is likely being done for the purposes of driving the vehicle – so safety is important, too. When it comes to old, vintage Porsche restoration, Foreign Affairs Motorsport value the history of the vehicle just as much as the way it runs. As a European auto repair workshop, every effort is made to preserve the rich history and value of a vintage car. It’s easy to damage or destroy an old car doing touch-ups, if you do not take it to a professional workshop. Bearing in mind the use of paint, authentic part replacements and careful attention to detail, Porsche restoration can have amazing end results. 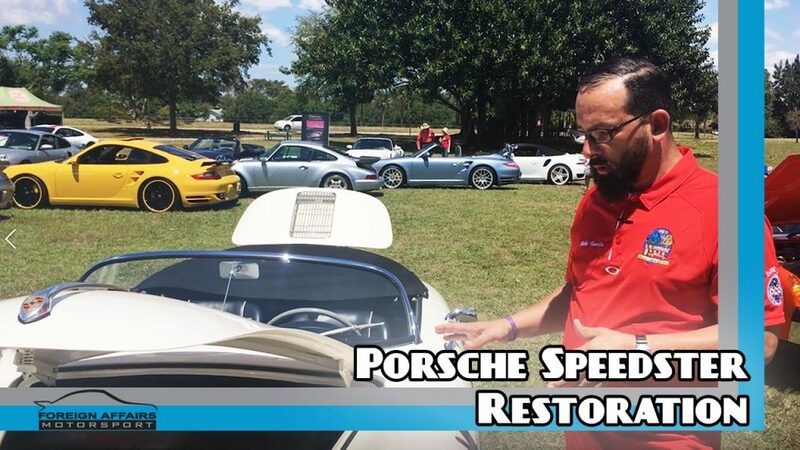 Join Foreign Affairs Motorsport’s Bobby Varela as he explores the restoration of a 1955 pre A 356 Speedster, with a 1600 motor, brought in by one of the workshop’s regular clients. Experts in motor repairs, restoration and preservation, we at Foreign Affairs Motorsport aim to marry the desire to keep original vintage parts with the need to give the driver the best drive possible. Check out our latest FAMTactics video to find out how much of the original could be kept on this vehicle. BOBBY VARELA: So today one of my very good customers brought his 1955 pre A 356 Speedster with a 1600 motor to come out to show everybody. Now, this vehicle has an extensive history – all of it is documented. He has a massive book with all the records, all the ownership, it’s quite amazing. Now, if you look at this vehicle everything is done to factory specification. So, if we come around and we start to look and see, you notice the leather strap, okay, we go down to the wheels you notice these are tubed – there’s a tube inside this tire – okay, very skinny. As we go down, here’s our coachbuilder – Rooter – very important because I believe there’s two in that era. Original. So many things original on here, it’s amazing. Now obviously some things won’t withstand the test of time – this is a driver’s car keep in mind. Original steering wheel, original gauges – those gauges are impossible to find any more and Chinese replicas have been made to take the place… not here, though, not here. If we take a look inside the engine bay, everything has been gone over as best as possible to keep and stay preserved. You will notice not everything is ten-point beautiful, but everything is clean and original, and that’s what we look for. Our nomenclature all of our polished pieces – these are actually anodized they’re not chromed, most people don’t know that, they think they’re plated, they’re not. This car was paint corrected recently, that’s why it looks so pretty and a lot of the pieces on the outside were taken off to perform this. So, our handles, our Beltline moldings, our mirrors, our nomenclature – all was removed so it can be properly paint corrected – and again paint correction is not using paint, okay? Thank you.